A Digital Imaging Technician (or DIT) works directly with the cinematographer. They manage a production's workflow and are responsible for image quality control and on-set color correction. With the digital camera revolution though, the job has seen a huge shift from on-set engineering to computer workflows. What if there was a portable solution for this? 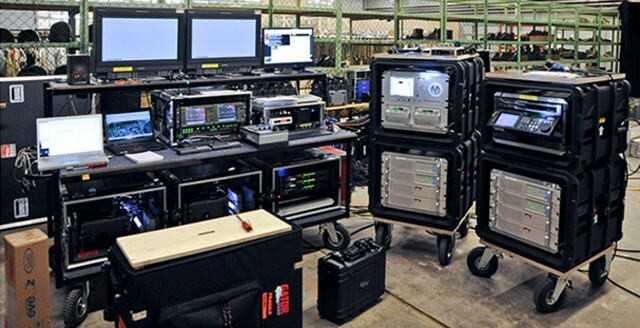 Unfortunately, the above configuration can bring and has brought some serious problems, especially when working on set. The equipment is connected through many external connections and numerous plugs. System instability. The whole cart is very unstable, which may risk and affect the on-site shooting progress. As a result, the cart can easily be damaged during transportation. Inefficiency. After entering the shooting scene, it is necessary to re-install and debug the equipment. ACME's BCCD III (pending name) for DIT is a triple 24" 4K monitor system which has the ability to integrate most of the DIT cart into a small, easy-to-carry and safe-to-transfer solution. Portable DIT workstation is compatible with DaVinci, Resolve, and Mistika Software. Three separate displays allow for three simultaneous workflows such as color correction, image manipulation, data backup, and systemization. The DIT can choose from various choices of processing power, big RAID storage capacities and display qualities.